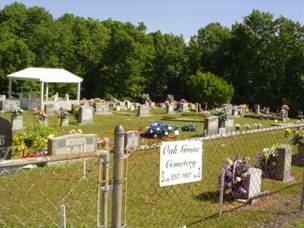 The Oak Grove cemetery lies in the western end of Lauderdale County, Alabama, off Co. Rd. #14 also known as Waterloo Road. 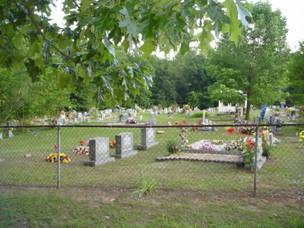 To reach the cemetery, travel west toward Waterloo on Co. Rd. #14, turning right onto Co. Rd. #129. Travel 1 mile to Co. Rd. #121, turning left and travel 1.3 miles to cemetery on right. 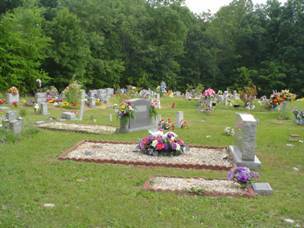 The cemetery was established in 1907. Carr, Eva (Woods); b. 02 Jan 1932, d. 17 Dec 2004, wife of J.T. Green, Ella; b. 12 Dec 1878, d. 23 Apr 1921, wife of W.M. Phillips, Elizabeth; b. 15 Feb 1886, d. 24 Aug 1926, 1st wife of E.P. Phillips, Leona; b. 09 May 1907, d. 17 Apr 1935, 2nd wife of E.P. Woods, Mary; b. 08 May 1865, d. 13 Feb 1937, wife of James H.